A Hip inspired Dual Column Rectangle Umbrella allows great coverage without numerous post distractions. Its' trusted, highly recognized design makes this shade structure superior for creative applications that can reinvigorate many areas. The high density polyethylene fabric is highly breathable and water resistant. The fabric allows hot air to rise and escape, reducing the feel like temperatures while keeping the covered area dry. A stabilizing UV additive is in the material which acts as a shield inhibiting exposure to damaging UV rays, all which encourages longer stays. The long rectangle design is great for covering picnic tables, pool lounges, benches and bike racks. Engineered specifically for the rigors of harsh weather and high speed winds, Hip style structures has an all steel construction. The heavy gauge steel post and support ribs are fully primed and sealed in a multi-step powder-coated finish, combating rust and corrosion. In the event of severe weather or need for off season storage, Glide Elbows allow a quick, easy and safe removal and reinstall of the shade fabric. To ensure maximum security and stability, it's suggested for these structures to be secured with reinforced concrete footings. 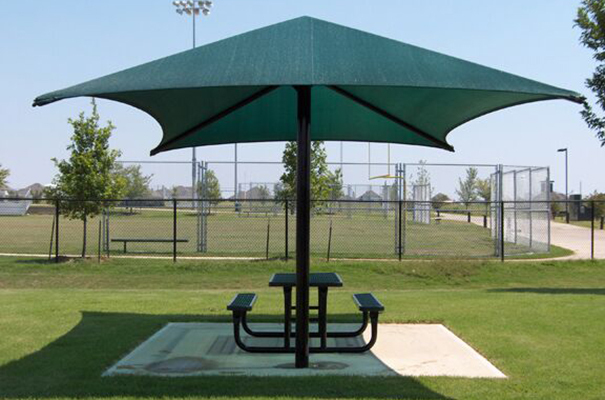 The Dual Column Shade Structure is ASTM, CSFM and NFPA certified.